This plant has a long story to tell, connecting Culpeper, Linnaeus, Charles Darwin and Carlos Castaneda, via shamans, drug users and asthmatics. Its powerful presence in the history of botany and herbalism is due to the tropane alkaloids it contains: atropine, hyoscyamine and scopolamine, which inhibit certain nerve pathways. Datura belongs to the plant family Solanaceae, together with deadly nightshade, another potent source of atropine. But also in this family are cultivated fruits such as aubergine, peppers and tomatoes, and potatoes. I do wonder how these were first cultivated, and how many casualties there were from the first breeding experiments – we know that unripe fruits of these, and green potatoes, can still cause illness. This particular plant has been growing for a few years in the middle of some waste ground in my village. I’ve also seen it on the river bank nearby, and planted in public flower beds, but the waste ground specimen is the largest and, I presume, oldest. 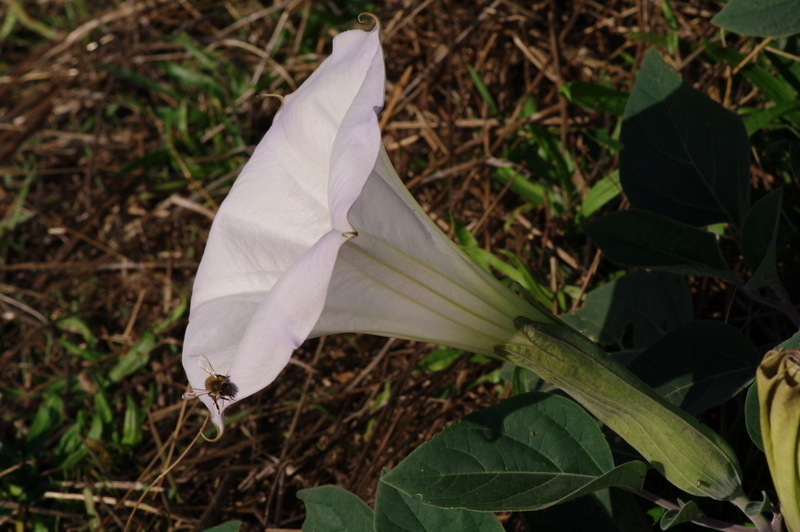 At first I thought it was Datura stramonium (Thornapple), but the latter has green stems, more jagged leaves, smaller flowers and upright fruits , while D. wrightii has purplish stems, wavy-edged dark leaves, large flowers and hanging fruits. 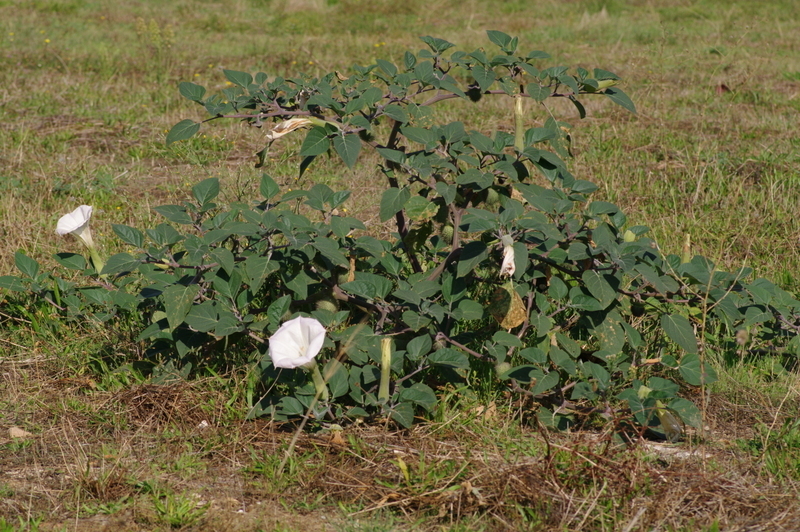 All species of Datura – there are nine – are very variable, especially in size, depending on location. 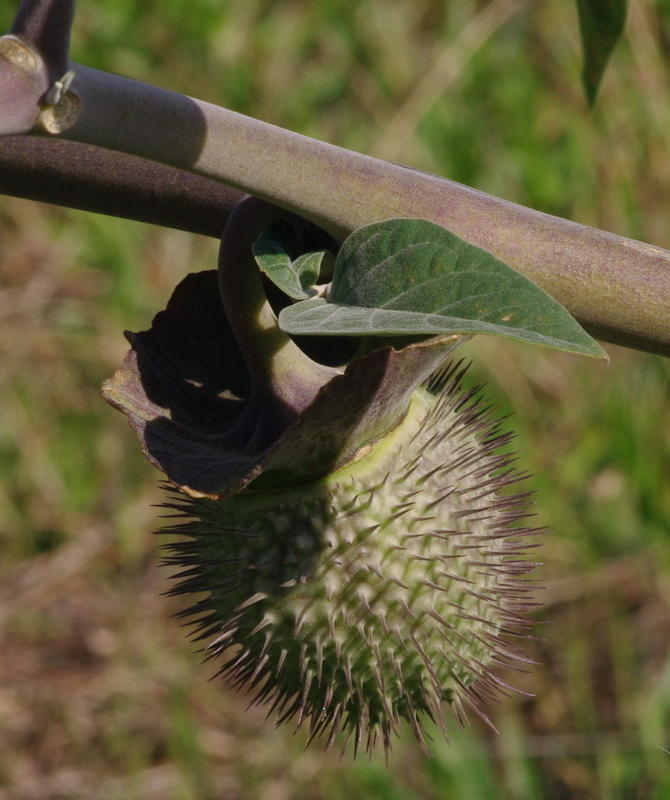 The name thornapple of course comes from the large spiny fruit capsules. 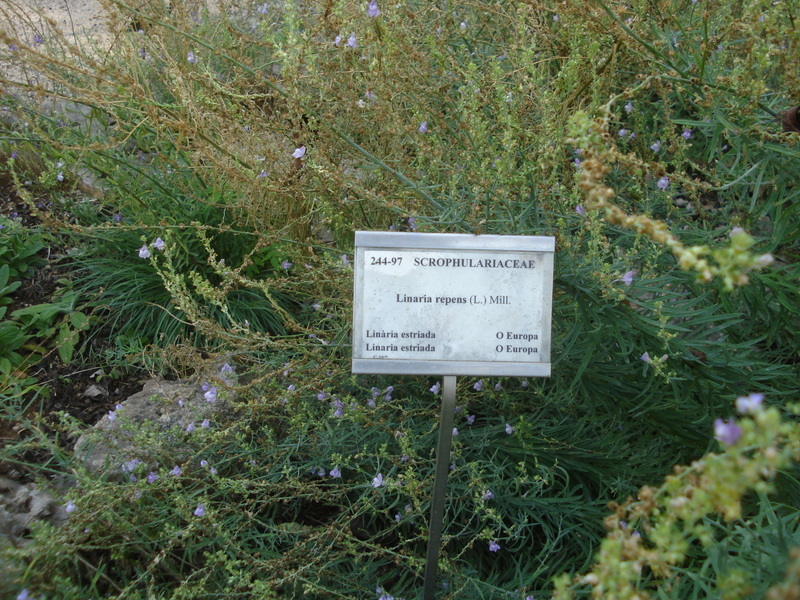 Both are introduced species, probably for decoration in gardens, but have spread and naturalised locally in southern France, Spain, and round the Mediterranean generally. D. stramonium was the first species to be scientifically described and named Datura, from the Hindi word dhatura for the plant, by Linnaeus in 1753, though it had already been described as thornapple by Nicholas Culpeper a century before. 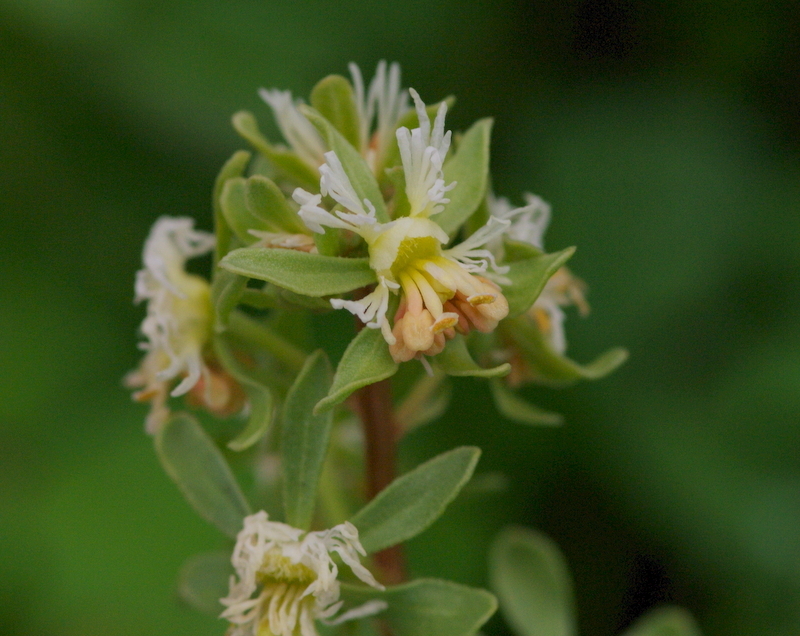 It’s thought that the genus originated in what is now the south-west United States and Mexico, where the greatest species diversity exists, but very soon it must have arrived in India, where it has a long history in Ayurvedic medicine. Why the asthma connection? Apparently the flowers can be rolled up and smoked like a cigarette to relieve symptoms of asthma – the alkaloids inhibit the muscles in the airway walls, and so enlarge the bronchioles, making it easier to breathe. Due to other effects (see below) I would not recommend this. gather’d very young for a boil’d salad, by some of the soldiers sent thither to quell the rebellion of Bacon (1676); and some of them ate plentifully of it, the effect of which was a very pleasant comedy, for they turned natural fools upon it for several days: one would blow up a feather in the air; another would dart straws at it with much fury; and another, stark naked, was sitting up in a corner like a monkey, grinning and making mows [grimaces] at them; a fourth would fondly kiss and paw his companions, and sneer in their faces with a countenance more antic than any in a Dutch droll. The effects lasted for eleven days. (from The History and Present State of Virginia, 1705, via wikipedia). Datura wrightii was named in 1859 by the botanist Eduard Regel for the American plant collector Charles Wright (1811-85), who had found it in Texas in the 1850s. Wright did a lot of collecting for Asa Gray, Professor of Natural History at Harvard. 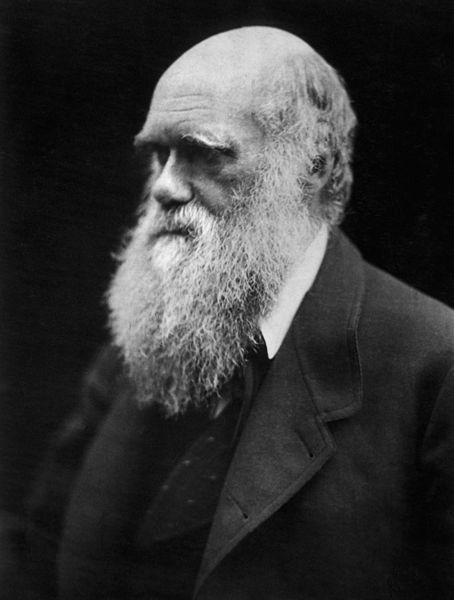 Although he was a member of the First Church in Cambridge, Gray was a stalwart supporter of Charles Darwin and tried to reconcile theism with evolution. In view of the early world-wide spread of Datura, it’s interesting that Gray’s knowledge of American flora helped Darwin establish that fruits and seeds could cross the Atlantic. Stanley Welsh, author of A Utah Flora, has this to say about Datura wrightii: “The flowers are the largest of any native plant in Utah, and are sweetly scented. The herbage smells like a wet dog”. Lovely. So let’s get on to the sacred aspect, which is connected to the toxic qualities. 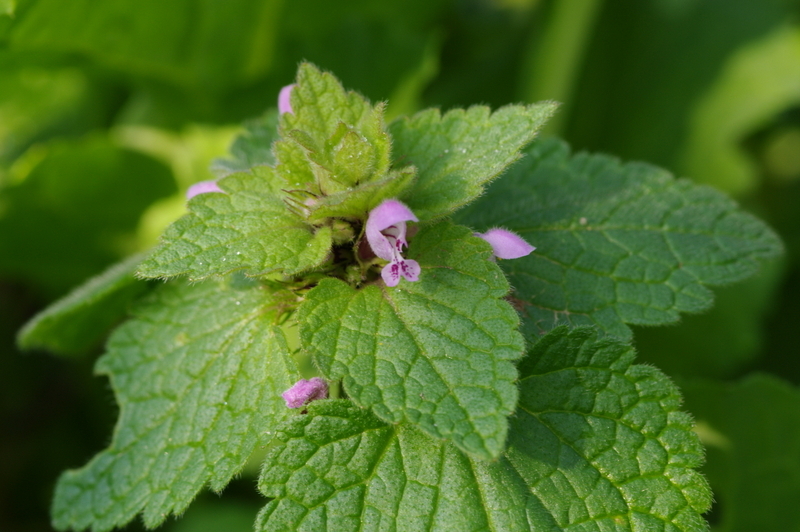 All parts of the plant contain the alkaloids which cause delirium, delusion, fast heartbeat and a rise in body temperature, followed often by amnesia. This is serious enough to be fatal in a large number of cases. The plants are especially dangerous because the concentration of alkaloids, and their relative proportions, can vary greatly, so users never know what dose they are taking. On Monday, July 1, I cut the Datura plants don Juan had asked for. I waited until it was fairly dark to do the dancing around the plants because I did not want anybody to see me. I felt quite apprehensive. I was sure someone was going to witness my strange acts. 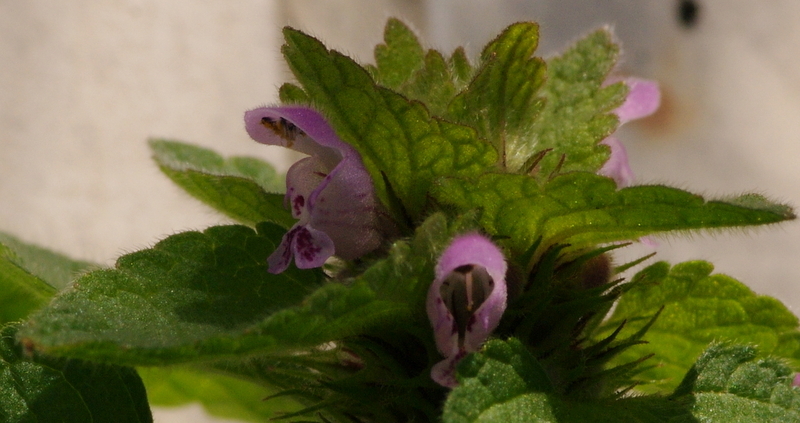 I had previously chosen the plants I thought were a male and a female. I had to cut off sixteen inches of the root of each one, and digging to that depth with a wooden stick was not an easy task. It took me hours. I had to finish the job in complete darkness, and when I was ready to cut them I had to use a flashlight. My original apprehension that somebody would watch me was minimal compared with the fear that someone would spot the light in the bushes. I took the plants to don Juan’s house on Tuesday, July 2. He opened the bundles and examined the pieces. He said he still had to give me the seeds of his plants. He pushed a mortar in front of me. He took a glass jar and emptied its contents — dried seeds lumped together — into the mortar. On July 4, 1963 Castaneda applied the ointment he and Don Juan concocted over a period of days. Following that application Castaneda relates that he turned into a crow with the full ability to fly. As with all Castaneda’s writings, you can believe what he says or not. 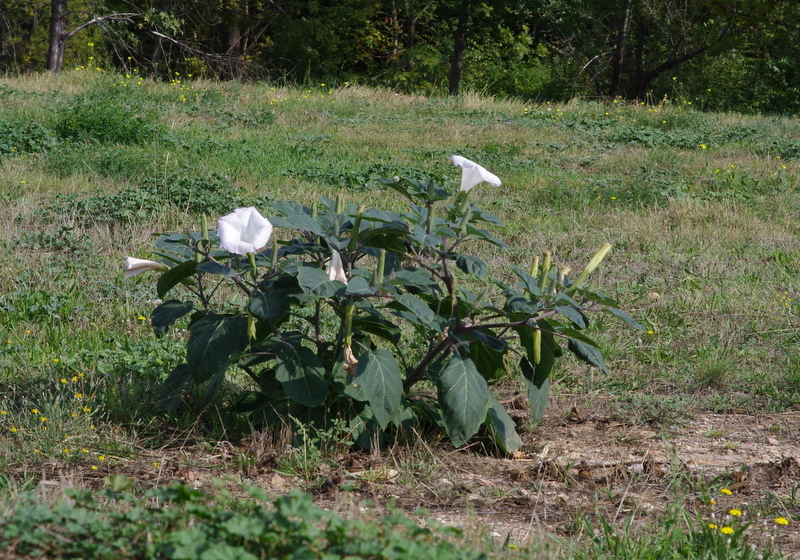 I can only tell you that we have many Datura plants in my village, but very few crows. The young people here prefer the reliable results of Red Bull and Heineken. You may have been afraid that after all the above,I was going to play you Cliff Richard’s Devil Woman. It’s OK, I wouldn’t be that cruel. Here’s something which should have become a jazz standard, instead of a very good pop song, which describes Castaneda’s evening antics. I go out these days not expecting to see much in the way of flowers – but keen to see something because I have new kit to try out. Chaiselongue and I decided, in the traditional spirit of seasonal extravagance and instant gratification, to exchange presents early, which for me means I now have her Pentax K7 with a spanking new 100mm macro lens. If your main subject is flowers, this is not the most exciting time of year. So I wander in the vines with a mixture of hope and resignation, and when I see something I haven’t seen before I’m more excited and grateful than usual. And this little flower is now my new best friend. 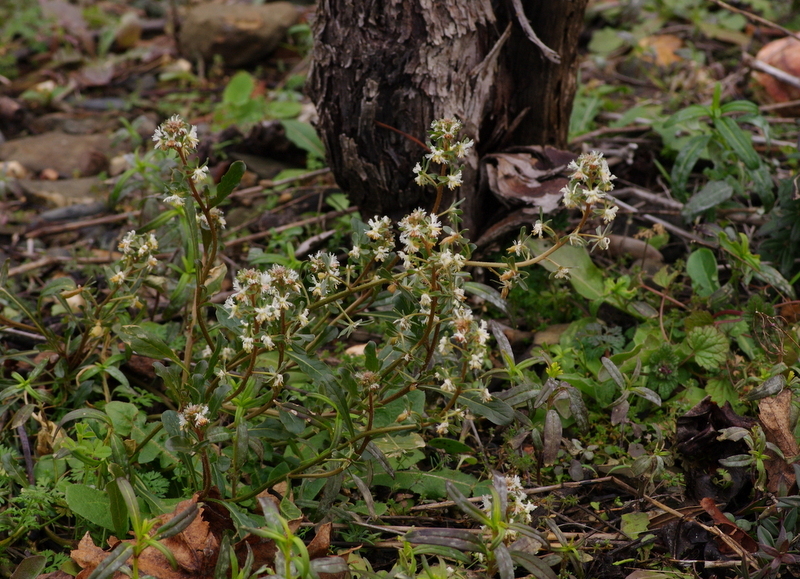 Reseda phyteuma (Corn mignonette, in an English which seems more like Franglais) is a small plant, usually only 10-30cm tall, which likes sandy and dry ground. I found this in a vineyard which is on a flood plain of a small river, so the soil is sand and gravel. In French mignon means pretty, or cute, and I guess the frilly petals fit that description. 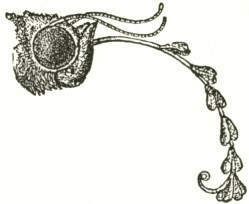 Other distinguishing features: the six sepals look like small leaves, and the stamens seem out of scale for the small flower; they bear pink or orange anthers. 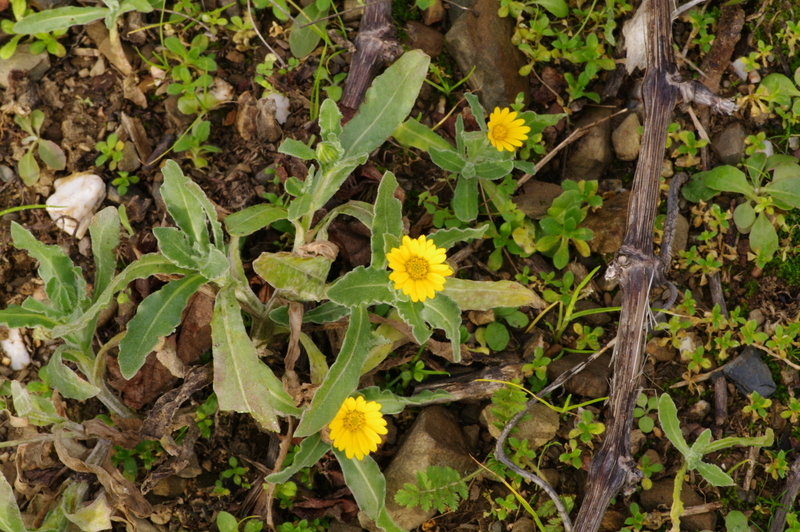 It is supposed to flower from April to September – this one has lost its calendar. Et maintenant, c’est mignon, c’est chouette, c’est Thurston Harris et Little bitty pretty one, de 1957. Coming up next: trees with balls. This little flower has reappeared in the last month or so, an irrepressibly cheerful sight this dark time of year. It’s a composite flower of the Asteraceae family – so named for their similarity in form to stars – the outer female florets sporting a long strap petal, and the inner male florets being simple tubes. The colours range from yellow into orange, emphasising the individuality of each one. 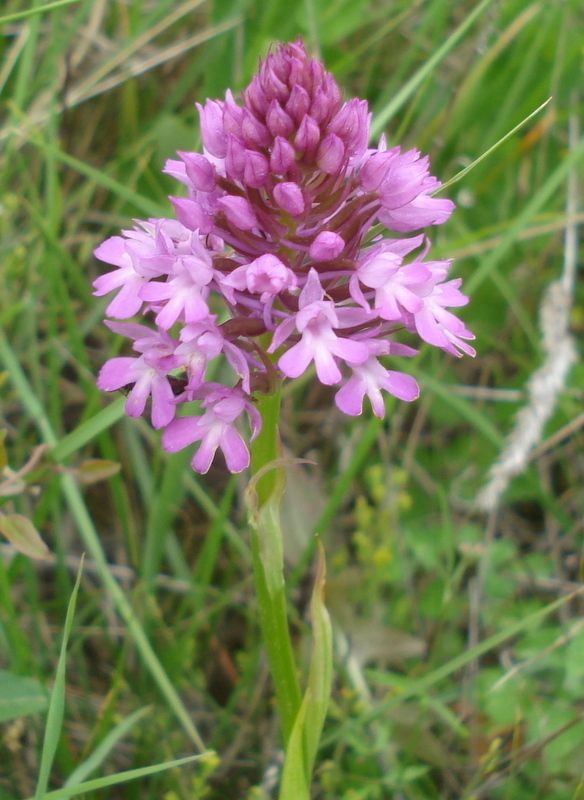 It’s an annual which is supposed to flower all year round – hence its Latin name, from the Roman Calendae, the first day of each month – but here it seems to die back in the summer heat. It’s an annual, having to regerminate from seed, which is easier in the autumn rains. It’s also a rapid coloniser of cultivated, ploughed land so it often appears here at the edges of vineyards. 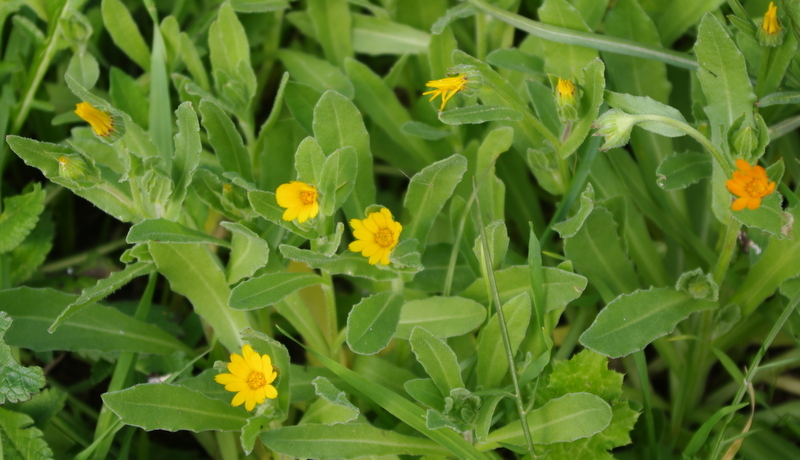 The scientific name is probably more familiar than those of most plant genera because of its healing properties, although most products seem to be made from the cultivated marigold, Calendula officinalis. It’s anti-everything: antifungal, antiseptic, anti-inflammatory etc. Why ‘marigold’? Because as a healing plant brought from the Mediterranean to northern Europe in the Middle Ages it was named in honour of the Virgin Mary, to distinguish it from other, non-therapeutic ‘golds’ such as chrysanthemums. Its name in French is Souci des champs, souci usually meaning a worry or concern. That doesn’t seem the right name for something pretty, long-flowering and healthy, and in fact it is the wrong interpretation: souci in this context comes via old French soulsie from the Latin sol sequia, meaning sun follower, because the flowers open in sunlight. The strong points of the series for me were the photography, and Attenborough’s awareness of the interdependence of the whole natural world: bats needing nectar, flowers needing to be pollinated, fungi exchanging nutrients with green plants, and so on. But I can’t help being in two minds about the films, as I am about Kew itself. 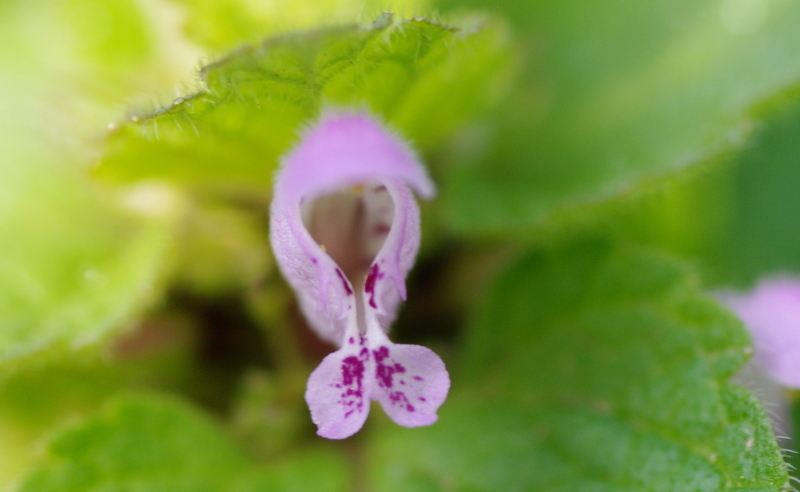 I haven’t got a TV so I was the more taken aback by the relentless search for an exciting visual, and hence the focus on flowering rather than any other plant process. And the ‘making of’ feature brought home to me how in some ways the sheer tonnage of high-tech equipment deployed began to dictate the film: if something could be done, with an expensive gadget (3D cameras, booms, robot helicopter cameras) for the first time ever, then it HAD to be done. 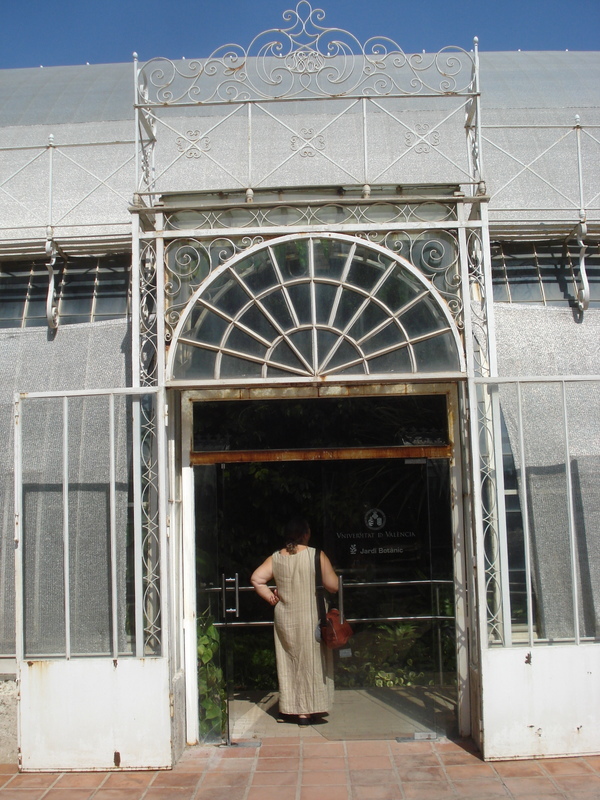 I only have a vague memory of going once to Kew with my parents: I just recall a lot of rhododendrons. In the films Kew itself is ever-present, constantly lauded and never questioned, given a respect that even deities don’t enjoy these days. It is a fascinating place, but it fills me with very mixed emotions. On the one hand I agree with the superlatives: it does have over 40,000 plants actually growing there, while I think I’ll be lucky to see half the 2,000 or so species growing near my home – present count is only about 120. On the other hand: maybe it’s a kink in my personality, but I always want to puncture inflated reputations, deserved or not. 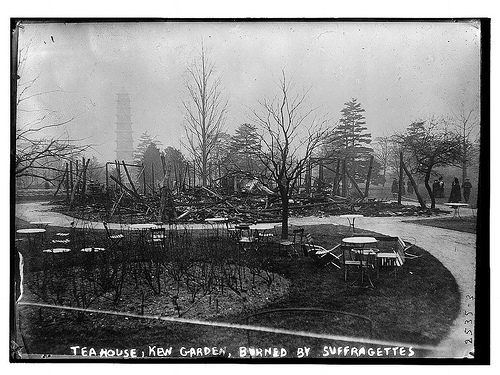 Kew Gardens have undergone several metamorphoses since their origins around 1720 as private pleasure gardens for the royalty whom Britain imported from Hanover after the Act of Settlement, and with whom the country is still saddled. Kew is still a ‘Royal Botanic Garden’. 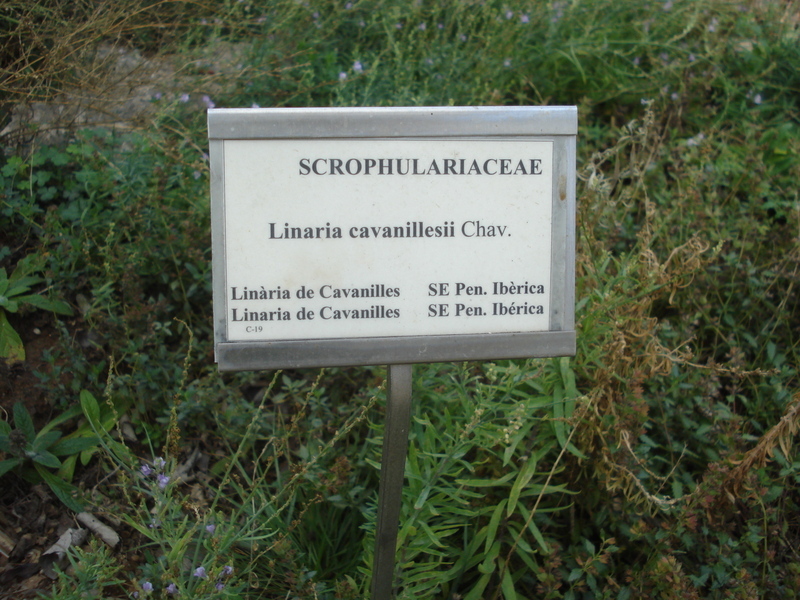 As with many botanic gardens, it served initially as an ego-project, each prince and king in Europe vying to have the greatest number and the most exotic species. The cost of botany was high and many plant collectors died: Captain Cook’s 1768-71 Pacific voyage in the Endeavour cost the lives of 38 crew members, and Joseph Banks, the botanist (and later Kew adviser) who went with him, lost five of his eight staff while amassing 3,600 dried plants. Kew began serious collection of plants targeted for the needs of the British Empire in the 19th century, transporting from one continent to another tea, rubber and many other plants – for the benefit of the colonial planters. We forget what the lifestyles of the Victorian upper classes were like. 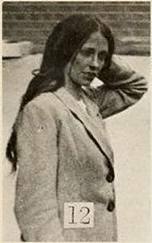 For example, in 1868 Charles Darwin and his family went to the Isle of Wight on holiday, renting a cottage from the photographer Julia Margaret Cameron, for whom he sat for a portrait. 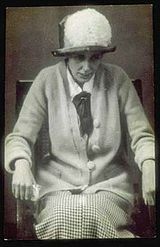 Her family lived solely from the proceeds of their coffee plantations in Ceylon. 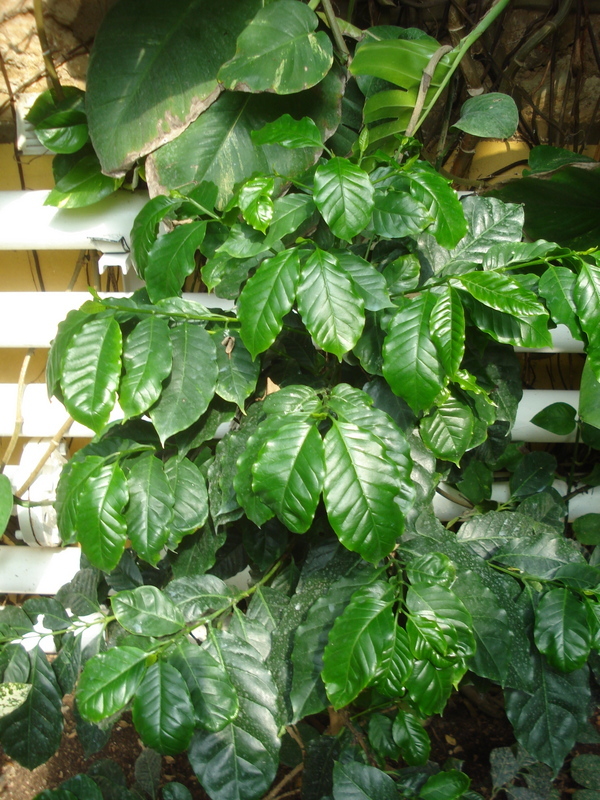 While coffee had originally been brought there by the Dutch (who had stolen plants from Mocha in Yemen), it was Kew who stepped in with Liberian varieties in 1873 when a quarter of Ceylon’s plantations were wiped out by disease. 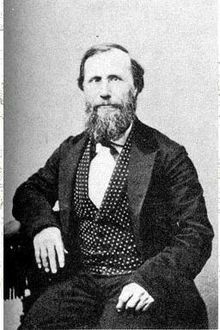 Darwin’s own private income came mostly from his tenant farmers and railway shares. I’m realising that the history of Kew is too full and too interesting to cover here, including as it does much of the history of botany itself, so I’ll come back later to these and other themes, including a bizarre minor skirmish in the battle of the sexes. 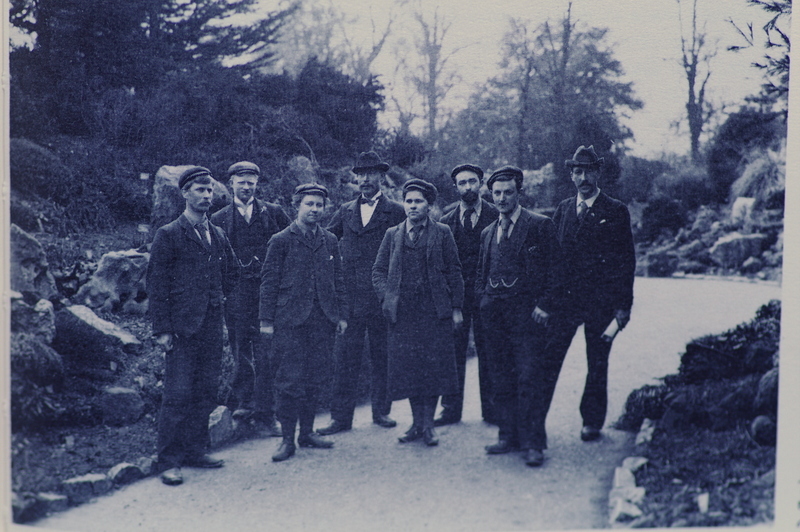 The reinvention of Kew in the last century has been as a scientific institution – although that’s not obvious from its website (here), which presents it as a jolly public attraction. But I’ll give credit where it’s due: the scientific work behind the scenes is invaluable, and is mentioned in the Kingdom of Plants. I’ll mention just two projects: the first is the use of its vast herbarium, which includes over 8 million specimens and covers 90% of all known plant species, to compile an internationally accepted list of named plants. The results are online at theplantlist.org (click to go there) and are available and indispensable to people like me, as well as to professionals. Because it’s winter and this post is about a garden, here’s a song Salvador recorded on one of his last albums, Chambre Avec Vue (2001), when he was 84. But this time it’s sung by Stacey Kent: Jardin d’hiver. 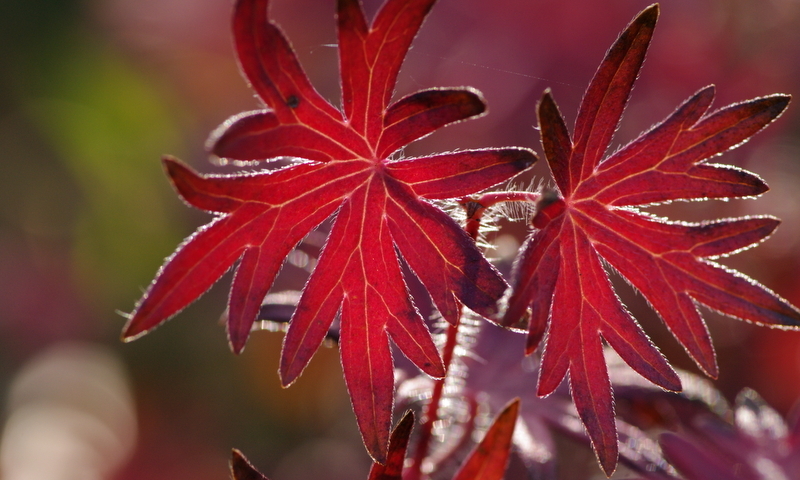 Coming up soon: Trying out a new camera, and seasonal colour. I’ve been on my holidays, which is why I haven’t posted for a while. 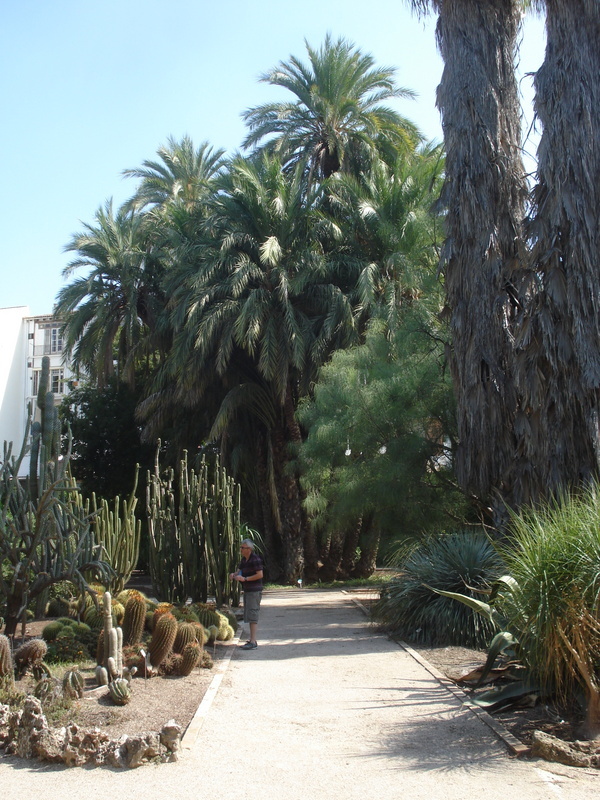 We didn’t spend all our time at the Valencia Botanic Garden, though I feel I could easily have done so – with, of course, evening sorties for tapas, which were wonderful in the city. So here are a few recollections of a very enjoyable morning in a place I quickly came to like very much. you see the blocks of flats which encircle the garden. It’s also very accessible for the valencianos: admission only 2€, and retired people can get a year’s pass for 16€, which may explain why it seemed very popular with grandparents and youngsters. To encourage a wide range of visitors it hosts some unexpected events – I loved the idea of the series of concerts there this year with different jazz groups each paired with a sustainable energy theme (2012 is the UN Year of Sustainable Energy For All: more here if like me you’ve missed it). On 20th October it will be ‘biomass’, and musicians Miquel Casany and Arturo Serra – no video but you can sample the music here). More about this and all else at the Garden on their interesting website here (mostly in English). Anyway, on to the plants. 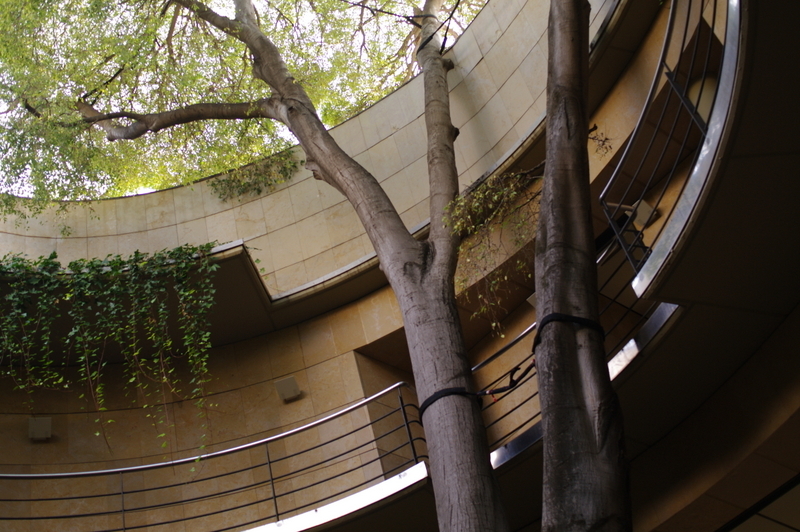 The main entrance is through the research building, opened in 2000, which must have been built around the huge hackberry tree, over 70 years old, which dominates the central round courtyard. The hackberry was traditionally used in the Valencian area to make rural tools, so one is immediately reminded of a sustainable resource in a vanishing way of life. 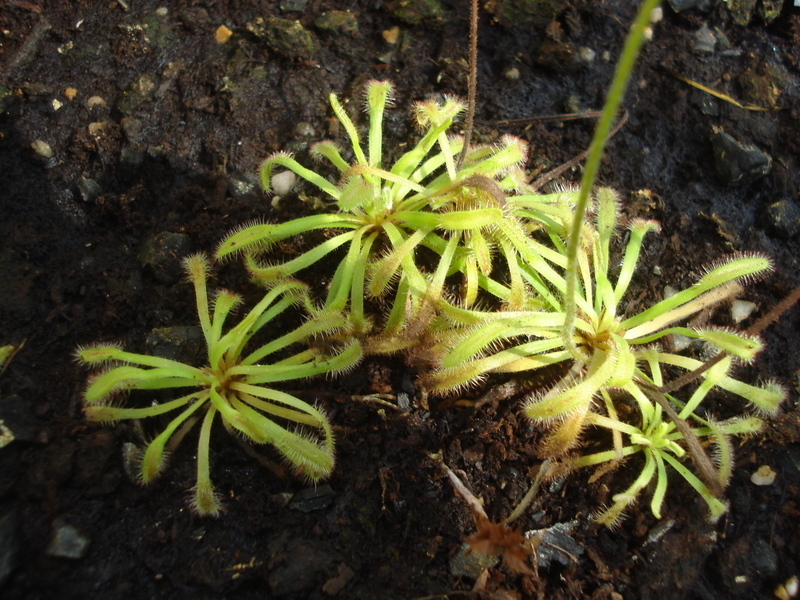 among them pitcher plants and Darwin’s favourite, Drosera (sundew) – ‘ I care more just now for Drosera than the origin of any species in the world’ he says in Ruth Padel’s poem The extra eye. 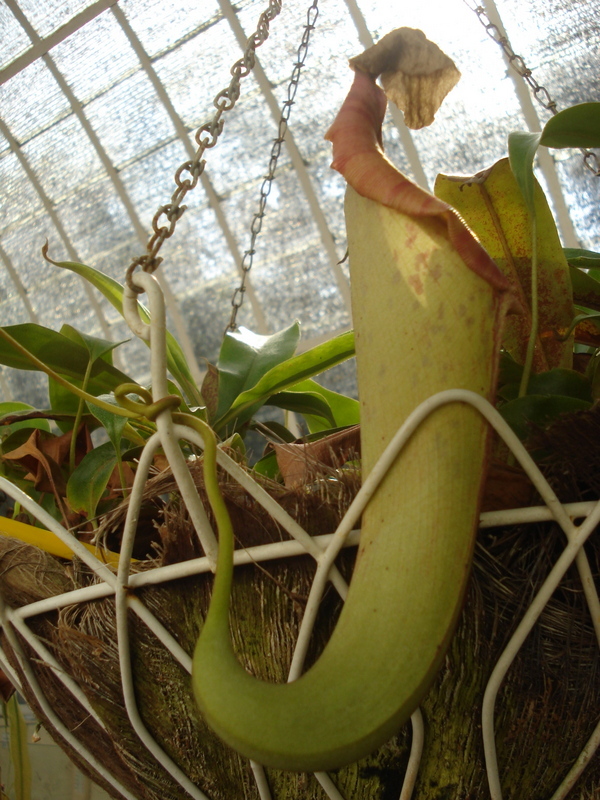 * Other subjects are ferns, orchids and bromeliads. craftsmen installed the 465 square metres of glass. It may have seemed huge then, but now I had the feeling I get when I’m poking around in a second-hand shop: the pleasure of discovering things I hadn’t seen before, such as a coffee plant, during a gentle shuffle along and back. 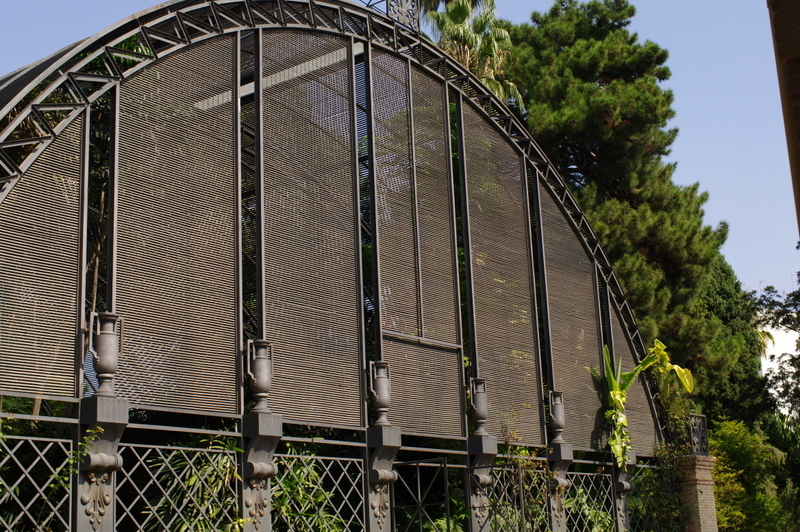 The architecturally impressive shade house contains plants that are used to a forest canopy rather than the strong blast of Valencia’s summer sun. In the rest of the garden I was thrilled to see a huge Ginkgo biloba, maybe the world’s oldest broadleaf tree species, a great variety of Euphorbias (a genus in a family that’s beginning to fascinate me), and in a lovely rock garden devoted to endemic plants a wide range of toadflaxes and antirrhinums. I was reminded of the Botanic Garden of Wales, which has a walled garden (dedicated to Alfred Russell Wallace) whose planted beds, shaped in a pattern like the DNA double helix, show variation within species and genera. On a small table on the way out is a selection of plants in pots for the gardener who has almost everything: you can buy a tiny baobab tree, or some sugar cane. Writing about our visit now, I’m still thinking, ‘lucky Valencians’. I couldn’t find a video of Miquel Casany and Arturo Serra, but to give you a glimpse of what we might be missing on 20th October, here’s Serra on vibes playing in Nerja, in Andalucia, last year – be patient with some wonky camerawork at the start for a lovely solo, very much in the reflective mood of the Botanic Garden .